Road-tripping around Australia isn’t always easy. Long distances with lots of nothing-much between attractions. Hazardous heat, dodgy roads and limited phone coverage. And – unless you’re an exhibitionist who loves squatting by the side of the road in full view – a LOT of leg-crossing between amenities! But it’s almost impossible to swing a long-tailed lizard – or drive more than a few kilometres – without hitting a scenic loo OR stunning landscape when you tour the Yorke Peninsula! 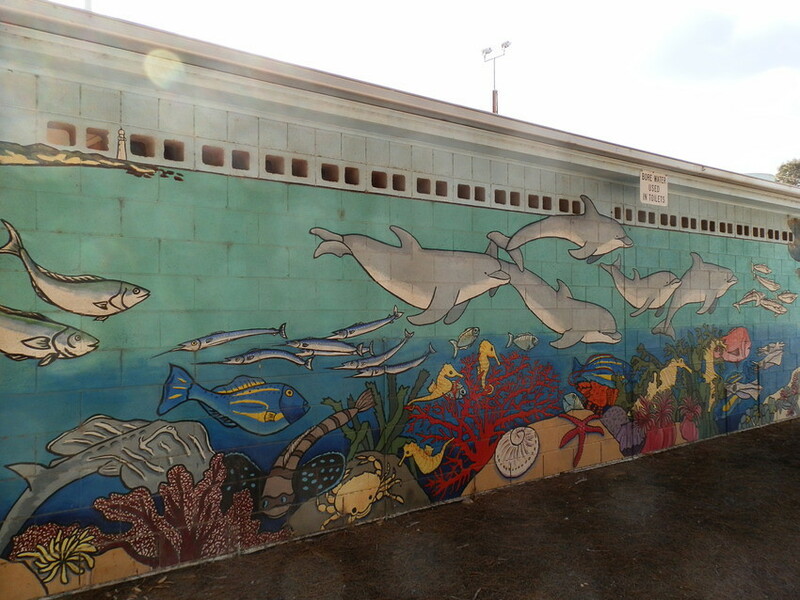 Port Victoria loo’s amazing mural might make you forget why you came! And in MY opinion, South Australia’s distinctive boot-shaped leg of land with over 700 km (~420 miles) of stunning coastline scattered with towns, beaches and superb natural attractions also boasts the highest concentration of scenic loos in Australia! Some scenic hotspots even have two. Or more! That’s why they’ve got their own special chapter in my book, Aussie Loos with Views! 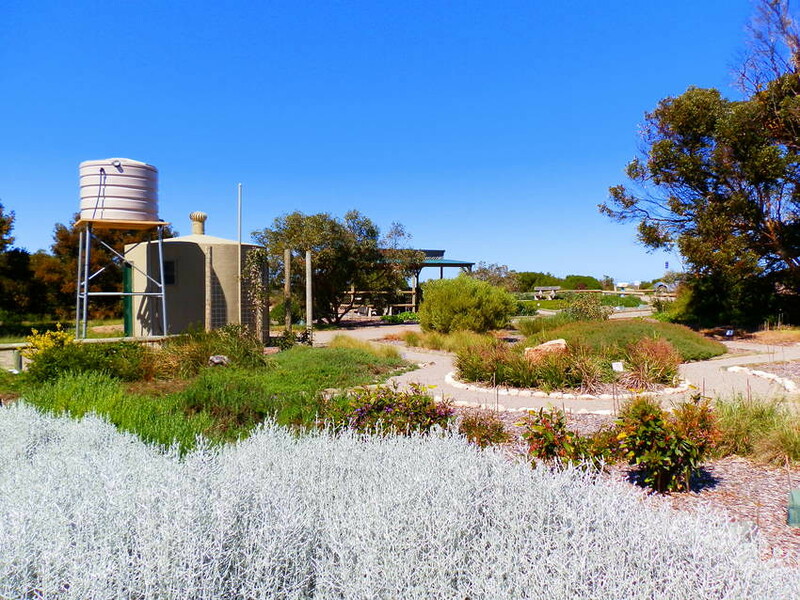 You won’t need to be a dunny detective to tour the Yorke Peninsula and discover my favourite Scenic Loos AND the attractions that go with them. From Adelaide, it’s only an hour’s drive north to Port Wakefield, and from there, you’re not too far from loo-lover heaven! 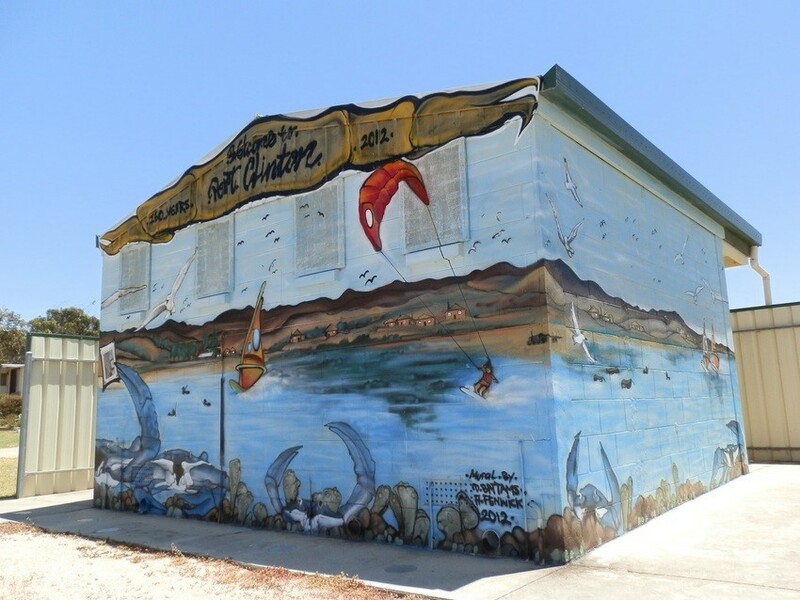 From Port Wakefield, it’s only a few more minutes down the Peninsula’s eastern side to Port Clinton and its superbly decorated loo next to the foreshore Caravan Park. Port Clinton’s also got unusual red cliffs at the end of the excellent crabbing beach, a longish cliff-top walk overlooking the mangrove flats to Price, and in summer, masses of migratory shorebirds who flew thousands of kilometres from Siberia to get here! Well … that gives ME a thrill! Another 15 minutes, another scenic loo near the Ardrossan Jetty with its awesome RED cliffs! Other Peninsula towns may well dispute Ardrossan’s claim to be home of the Blue Swimmer Crab, plentiful in the tidal shallows below during months with an ‘R’ in their name. But no one’s disputing Ardrossan as home of the Stump-Jump plough, a natty little invention which made harvesting the world’s best barley much easier! Enjoy a little something from the bakery at the vantage point above the jetty and loo – you might just see us there too! 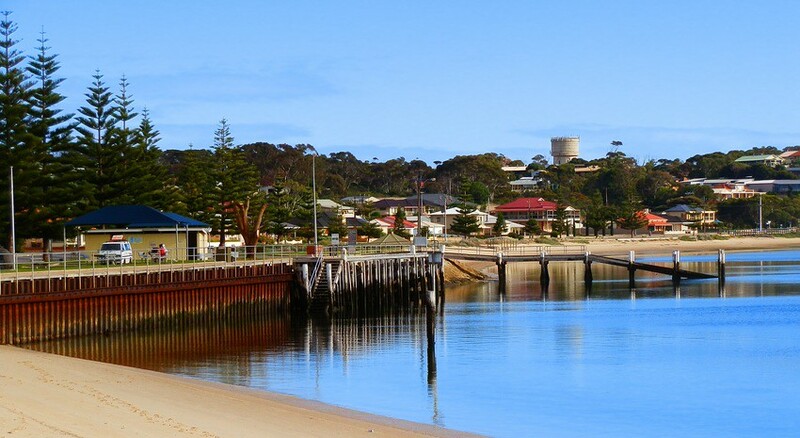 Half an hour further on and you’re spoilt for scenic-loo-choice in picturesque Port Vincent, its long, curved bay and beach, jetty and marina making it a favourite spot for fishing, boating, swimming and crabbing. The loo nestled at the base of the cliff-top at the trail head isn’t visible from above, but it’s one of the most scenic on the Peninsula from the jetty. And it’s hard to get a loo-free shot of the foreshore … so I didn’t even try (see top)! It’s only a few minutes further south to Wool Bay – you’ll never guess what was once its main export! 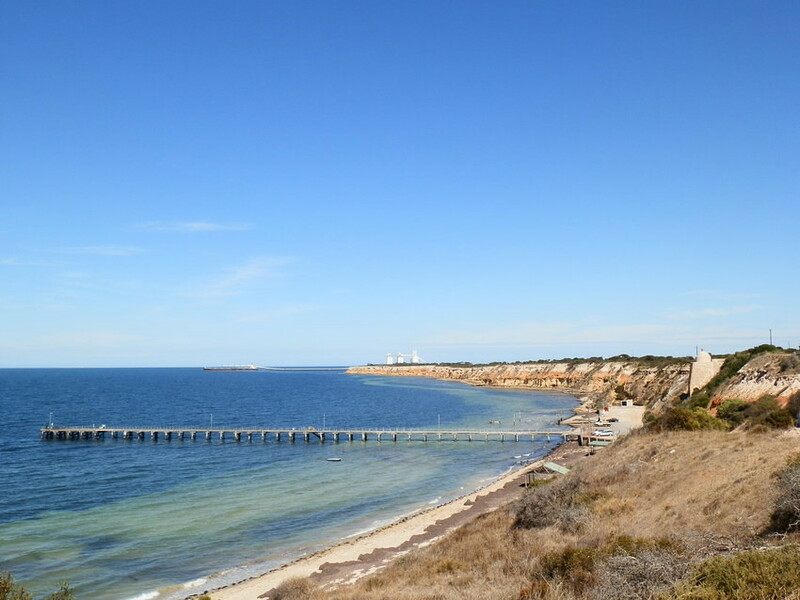 Although it wasn’t all about the wool – the restored lime kiln nearby stretches to the top of the cliff where there’s a superb view to Port Giles long jetty from which grain is shipped all over the world. Snorkel from the Wool Bay Jetty and you might just see South Australia’s Marine emblem – the Leafy Sea-Dragon – floating amongst the seaweed around the pylons. This tiny town once made a liar of me when I featured its temporary loo, superbly situated by the jetty after the original was destroyed in a landslide. The day after I posted that story, I returned to Wool Bay to find a more permanent – but far less scenic – structure, and NO SIGN of the temporary loo! 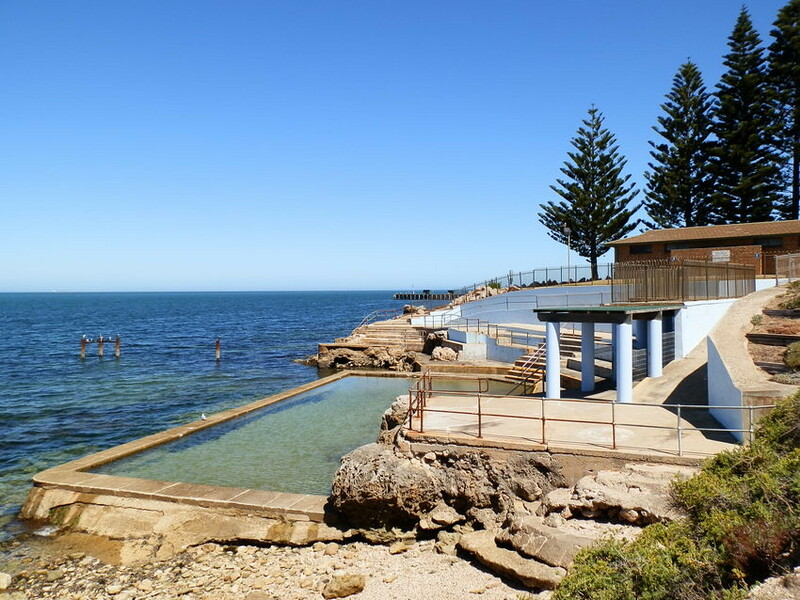 It’s only another 15 minutes from Wool Bay to the historic port of Edithburgh where the scenic loo above the tidal swimming pool gives great view over a classic Aussie seascape. Above on the cliff top, the golf course has a better than average selection of hazards! It’s also part of Walk the Yorke, a combination of ~500 km (~300 miles) of walking trails, roads and beaches stretching right around the Peninsula. 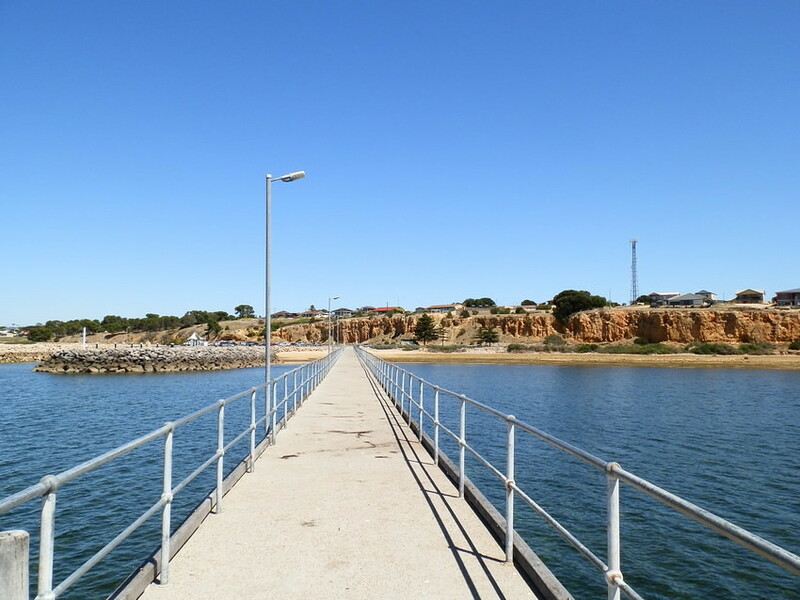 Walking the ~8 km (one way) section connecting Sultana Point, Edithburgh and Coobowie (site of another scenic loo) is a great way to experience the area’s natural attractions, and a visit to the historic museum a fascinating glimpse into the area’s history of salt mining and shipwrecks. On a nice day, there’s a better than average chance we might run into one another! The cliff-top loo with its lovely garden of local plants at the western end of Port Moorowie marks the access point to a cliff-top walk around the bay to McEachens Beach, and the series of superb beaches and reef (visible at low tide) along the way below. Of all the loos in Innes National Park, West Cape is the most spectacular – and for my money, it’s one of Australia’s best. The vast panorama of (generally) deserted beach, off-shore islands and lonely lighthouse above the wild, rugged rocks of the cape makes an awesome amenities setting! The rest of Innes National Park isn’t bad either. Magnificent coastal scenery, walking trails, seasonal wildflowers, fishing spots, beaches and sites of historic significance, this little gem has something for everyone. And if you don’t see an emu or a kangaroo, DON’T buy a lottery ticket because you’re quite possibly the unluckiest person in the world! There’s no loo near the lighthouse at Corny Point – the most north-westerly point of the spectacularly scenic drive north from Marion Bay, nearest town to Innes National Park. 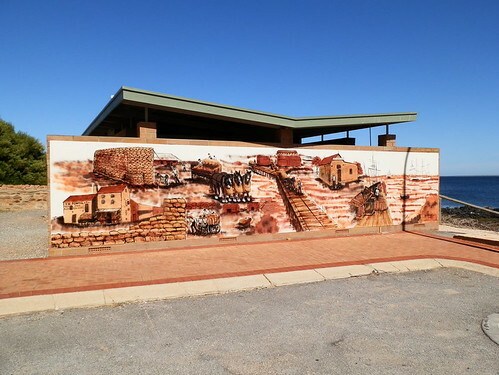 Back in the small township, however, you can’t miss the sports ground loo with its brightly coloured wraparound mural. 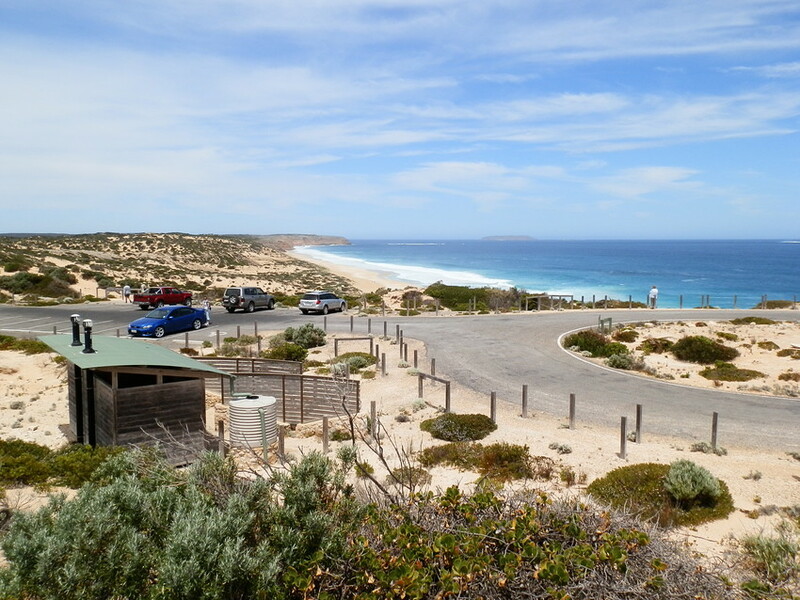 It’s the perfect stopping off point before another dose of superb scenery – if you’re up for sandy beaches, dunes and coastal scrub – along the coast road to Point Turton! Just before you get to this two-loo town from the west, there’s a new loo on the block at the Point Turton bathing area. At least it’s newly decorated! A stunning shower block/conveniences combo atop the cliffs it overlooks the swimming baths below – and further over the stunning colours of Hardwicke Bay. You could take a walk along the foreshore, or go fishing from the jetty, but if you want my advice, RUN, don’t walk to the Point Turton Tavern where both food and views are superb. And yes, on a fine day you might see me here as well! You might have noticed by now that the towns on the westerb side of the Yorke Peninsula are smaller. But if anything, the loos and their settings are even more spectacular! Take Port Rickaby, for example. Water almost tropical in clarity and colour, Norfolk Island Pines lining the road to the beach, white sand and rocks make this a picture-perfect loo setting. But that’s not all! There’s a walk down the coast to Barker Rocks AND a massive white-sand dune just down the road out of town. And if my MIL could climb it at age 80+, then so can you! Half an hour north, and the setting of the loo at the last windjammer port vies for your attention with the superb mural showing the town’s history. Offshore is Wardang Island, famous for the shipwrecks that make this a divers mecca – and infamous as a release point for the calicivirus to control a plague of rabbits! 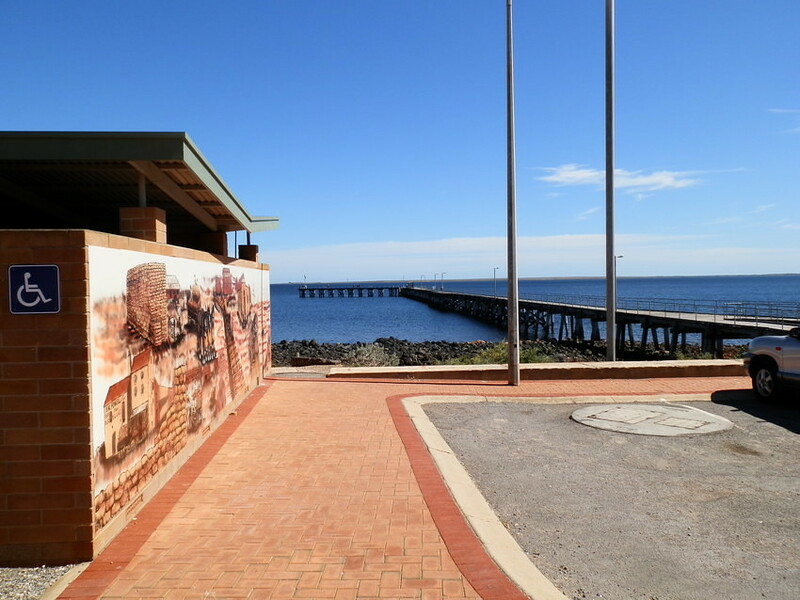 It’s difficult for a little old public loo to successfully compete with the fascinating maritime history museum, geology trail, diving hotspot and magnificent scenery that makes Port Victoria an attractive destination. But this one does quite well! 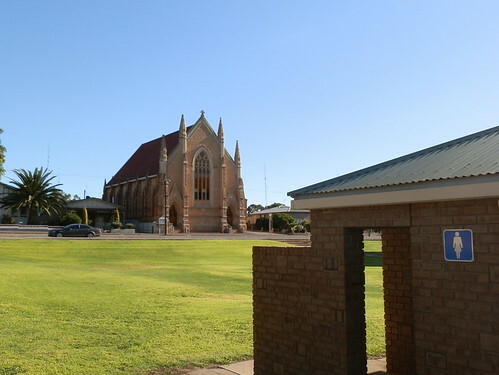 The church actually has nothing to do with the public loo in Moonta apart from being visible from it. But it makes a nice change from the mile after punishing mile of staggering scenery I’ve subjected you to so far, yes? 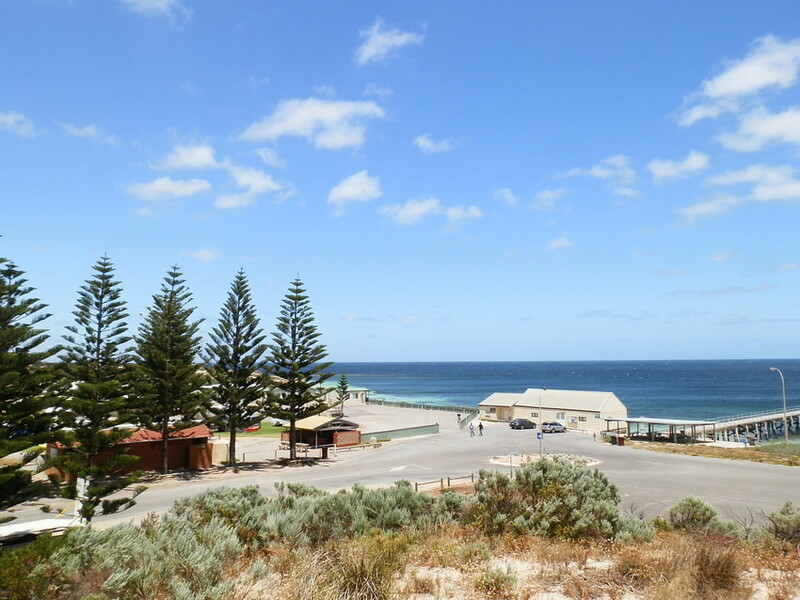 Although Moonta Bay, a few kilometres away on the coast has more of the same if you’re having withdrawal symptoms. But copper-mining town Moonta, full of influences from the Cornish miners who emigrated to work the mines, is an intriguing place to visit, especially the Moonta Mines Museum and the Kernewek Lowender, world’s largest Cornish festival held every two years. It’s a relief (in more ways than one) to combine stunning scenery with a lovely loo, and no one does it better than the Yorke Peninsula! So if my previous posts haven’t yet convinced you to tour the awesome Yorke Peninsula, then perhaps this one will! If you want a constant reminder of how awesome the Yorke Peninsula Loos are, check out the Calendar: 13 Red HOT Scenic Loos of the Yorke Peninsula in my RedBubble shop HERE! 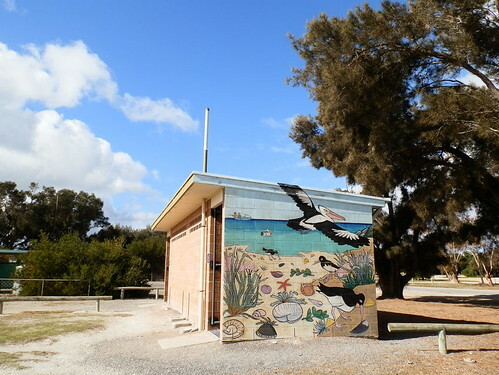 MORE Yorke Peninsula Scenic Loos on Flickr! MORE Yorke Peninsula Photos on Flickr! What’s this? A posting with cars in it? Well I was thinking of you today while writing my blog. Check it out and let me know if you have anything like my daily commute Downunder. A car? I must’ve slipped up and let a civilisation photo through 😀 And how could I POSSIBLY have anything like your daily commute down here – the traffic’s bad enough, but then you’re all driving on the WRONG SIDE OF THE ROAD!!!! It’s no wonder you’re loo inspired with that kind of infrastructure in your local hood. For all your efforts it sounds like you recorded a bit of brief history at Wool Bay. And I like your phrase “awesome amenities setting”! There are so many colourful loos down there. That’s why it gets my vote as the best loo collection in the country, Diane!! Every time I go there I find another one! Oh, Red, that sure is loo-lover heaven! Except Wool Bay Jetty – maybe the waves got in? The Edithburgh Tidal Pool is awesome, too! And Point Turton… Awww, I SO wanna buy a car again. In your country. In my opinion Yorke Peninsula is the prettiest stretch of coastline in Australia. Wonderful scenery and plenty of small towns to prevent boredom. I lived in Port Clinton when I was three and possibly four years old, before we came to Adelaide, I remember swimming in that tidal pool at Edithburgh. I’d love to go back to that area, but all the kids are here on this side and I’d never see them. Having a COOL loo every few kilometres makes it even easier to explore because you don’t have to cross your legs, Jo-Anne! All look great but I think my pick would be Wool Bay with its kiln as added interest. The Wool Bay kiln is quite amazing Andrew – it’s as high as the cliffs and a great vantage point to look up & down the coast. 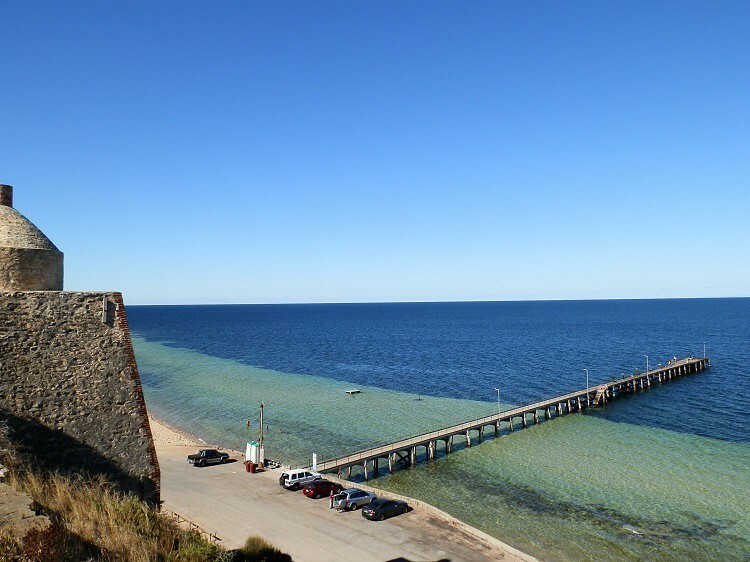 A lot of locations on the Yorke Peninsula have historic buildings, jetties and intriguing stories – a history/machinery buff would have a field day! Wow, your photos are just stunning! Thanks so much for taking me to these beautiful places! Thanx Liz! 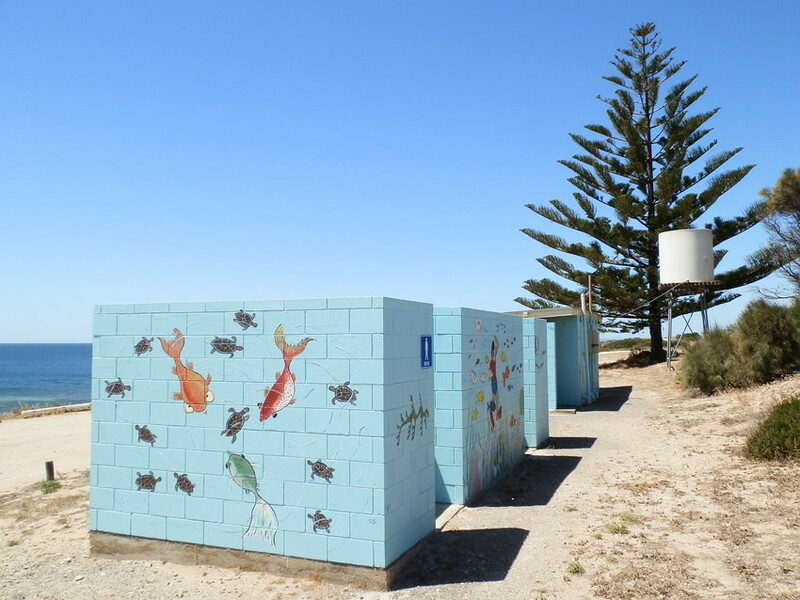 The Yorke Peninsula is one of the few places in OZ where the Public Amenities qualify as ‘beautiful places’; and the Loos are as much a tourist attraction as the natural wonders!